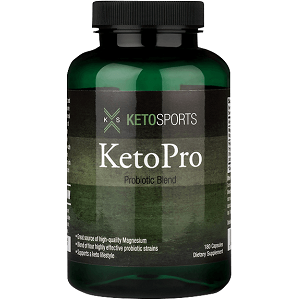 This review focuses on KetoPro Probiotic Blend, which is a dietary supplement that contains a number of probiotic bacteria that can supposedly be taken to support a high fat diet. These bacteria are designed to improve digestion and release of certain nutrients that the manufacturer says are often insufficient in a ketogenic diet. We will be assessing the validity of these claims as well as the standard that this product lives up to. We could not find any evidence to support the manufacturer’s claims about the benefit of these bacterial species as probiotic bacteria for a ketogenic diet. The research is very well understood that these bacteria metabolize carbohydrates and therefore may contribute to their improved absorption in humans. But the improved absorption and metabolism of carbohydrates in the intestine does not support a ketogenic diet. In fact, it reverses the effect of ketosis and stimulates the body to use carbohydrates for energy rather than fats (as it would when in ketosis). There is some evidence that a ketogenic diet may cause a magnesium deficiency, so that is likely why magnesium was included in this supplement. The manufacturer says that three capsules can be taken a day. Unfortunately, they do not specify what times of the day that the supplement should be taken nor whether it should be taken with meals or not. The daily dosage gives a person about 10 billion colony forming units of probiotic bacteria. Probiotics are safe for most people except for people who are immunocompromised (have a weaker immune system). This includes pregnant women and people on chronic medication for chronic conditions. Nursing mothers should be careful too. All three of the above group should consult a doctor before using this supplement. Some of the side effects that have been associated with use of probiotics are: an upset stomach with diarrhea, gas or bloating. The side effects usually go away within a few days but if they don’t, stop using the supplement. 180 capsules (which is about a two month supply) of KetoPro Probiotic Blend can be purchased online for $19.95. This price does not include shipping or taxes. This manufacturer does not offer a subscription service or bulk purchase discounts. The manufacturer explicitly states that they do not accept any returns because returned items cannot be restocked. They do welcome any contact from customers though, with their preferred method of contact being through social media. The only positive aspect about this supplement is that it is offered at a very low price. Despite its affordability, KetoPro Probiotic Blend has very little value with regard to ketosis. The manufacturer provides no reasoning for the inclusion of their unusual ingredients, and conventional science does not support the use of the probiotic bacteria in this supplement for a ketogenic diet. Furthermore, this manufacturer doesn’t offer any guarantee, so customers are very likely to waste their money, and be frustrated if they don’t see the results that this manufacturer promises. John Parker	reviewed KetoPro Probiotic Blend	on March 6th	 and gave it a rating of 3.